Namibia is the most arid country in sub-Saharan Africa. Due to the high variability in rainfall there is widely fluctuating forage production from year-to-year. Local farmers need to provide fodder for their herd till the next rainy season. Planning pro-actively is essential to be able to take necessary actions as soon as possible when conditions are deteriorating. Here remote sensing comes into play; learn more about Remote Sensing for livestock management in Namibia! Most of Namibia’s rangelands know a short rainy season followed by a 6-9 month long dry season. Poor or postponed management actions are likely to result in animal losses, missed marketing opportunities and eventually lead to rangeland degradation such as the loss of desirable, perennial grazing plants and accelerated soil erosion. Farmers, support agencies and policy makers need a system to provide reliable, accurate and timely information about the health of rangelands in order to support decision making with regards to animal production and rangeland management. It gives the ability to work pro-actively, more efficiently and to intervene at critical times when for example a forage shortage threatens to occur. The Rangeland early warning and monitoring system makes use of satellite technology. Earth observation satellites like PROBA-V monitor the activity (greenness) of our planet’s vegetation every day. Thanks to this data we can obtain information about the current growing season and provide easy to interpret action maps to our land users, farmers and other stakeholders. The information maps are made available through bi-weekly email service as well as an online portal, www.namibiarangelands.com. If below normal greenness occurs for prolonged periods during the late growing season, low forage production are to be expected and farmers are forewarned to take timely action. An example of the 4 year NDVI anomaly product for the 1 to 10 May 2018 period for the Erongo region in Namibia. The green areas on the map indicate above-normal greenness and the red below-normal greenness values and support stakeholders in critical decision making. Infrastructure such as roads, towns and farm and conservancy boundaries are included in the regional products to aid users to identify their area of interest. Currently the early warning system produces greenness (NDVI) anomaly maps in near real time on a decadal basis during the rainy season. The product range includes various anomaly products, as well as Vegetation Condition Index products. 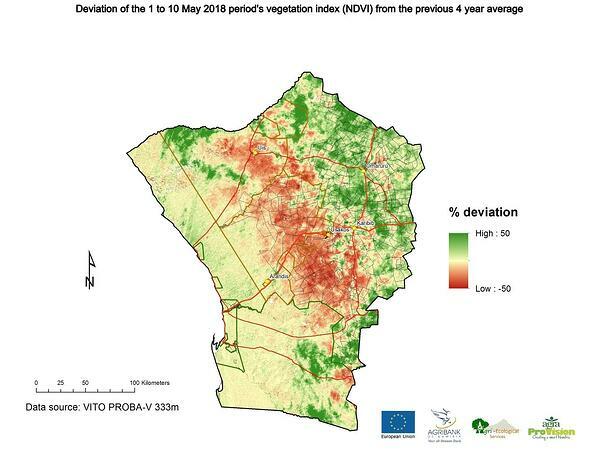 On-going research developments include the modelling of annual herbaceous production (making use of PROBA-V data) and use of other earth observation approaches to monitor rangeland conditions, as well as the development of a mobile phone application for land users to assist with dry season fodder flow planning for their specific situation (Rangeland Fodder Flow App available on Play Store (Android) and App Store (iOS)) . The Namibian rangeland early warning system was developed with funds of the European Union and recently also Agribank Namibia and is implemented by two local companies, Agra Limited and Agri-Ecological Services.